When it comes to deed forms, it’s the warranty deed that is considered to be the most reliable option over quitclaim deed. 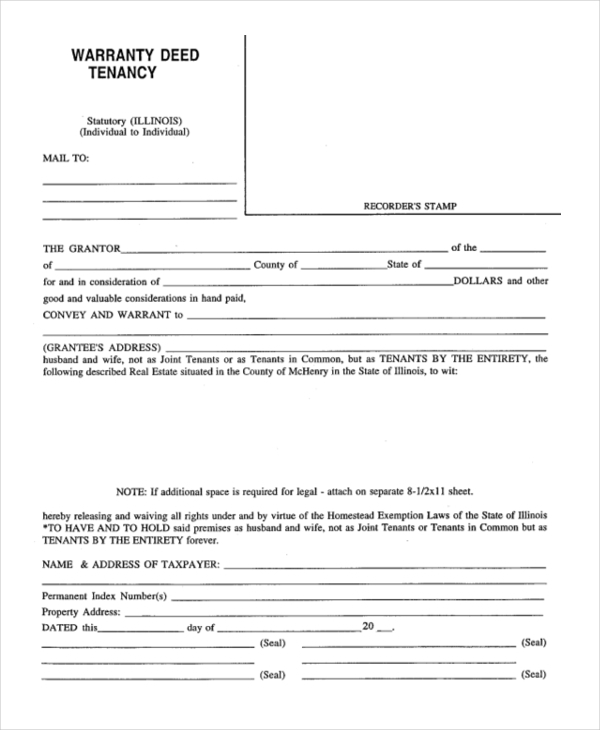 As the name suggests, the warranty deed is the one where the grantor offers the guarantee of holding clear title on his property or real estate that is to be conveyed to the grantee. These Deed Forms clearly specify what rights are being offered to the grantee and the responsibilities to be followed by the grantor as well. You have a detailed warranty deed here which comes complete with the standard legal language as well as details on what the grantor will warrant for the grantee. It concludes with notary signature. If you are looking for a warranty deed that will enable you to offer a complete description of the property to be transferred to, this warranty deed form is just the thing for you. 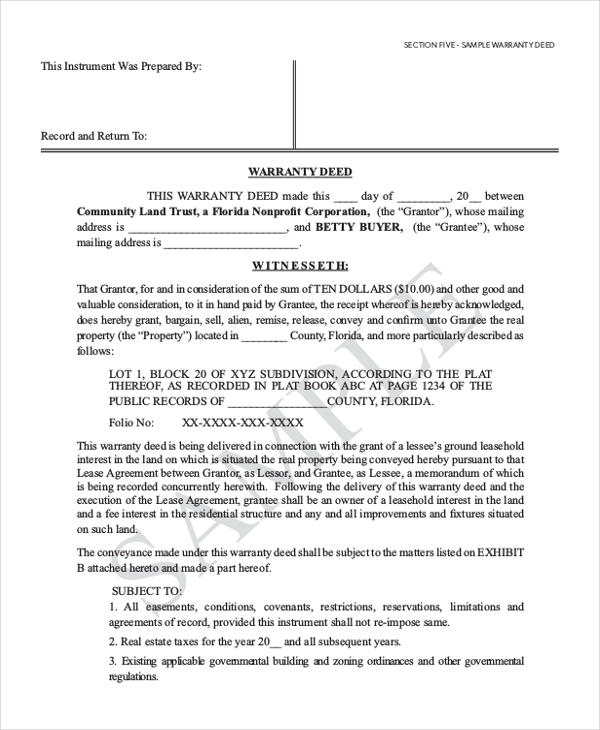 You have a standard warranty deed here which shows you how to format and present a declaration of the deed on part of the grantor, how to describe the property and at what conditions the conveyance is subjected to. 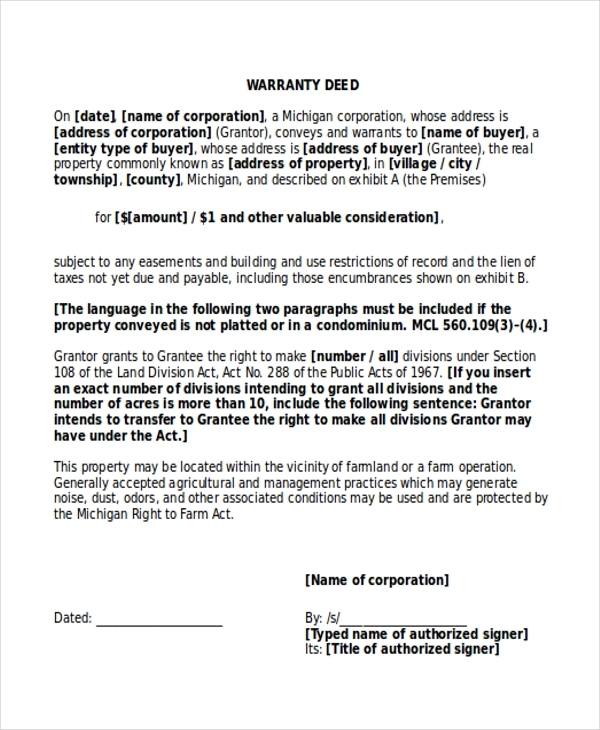 This warranty deed begins with a declaration that the grantor is willingly conveying the real property to the grantee and it also mentions the deed amount – the deed contains a description of the property as well. You have a proper sample for limited warranty deed here which comes with sections on deed tax, the agreement between the grantor and grantee and all other major sections for such a deed. You have a standard statutory warranty deed form here but before that the sample has offered detailed explanations on what each of the pertinent sections hold or specify regarding the warranty deed. 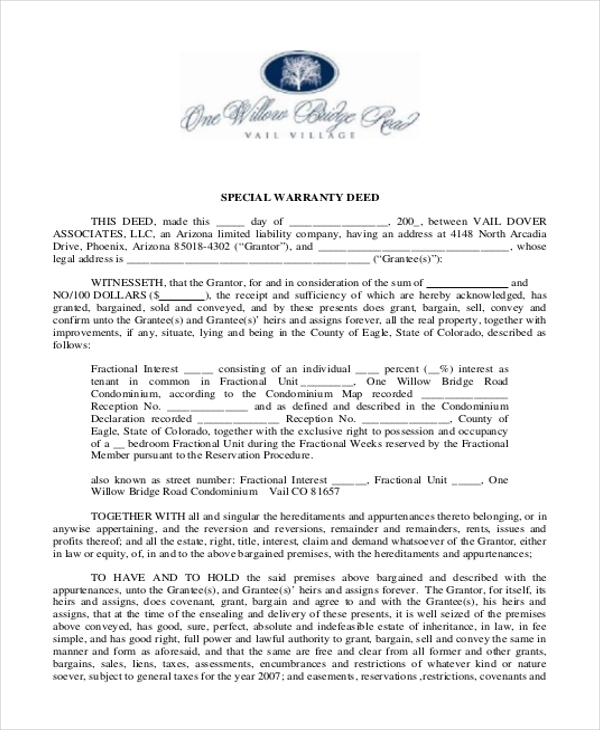 If you need a corporate warranty deed that will enable you to place the signature of minimum two witnesses, this form here would be handy for you. It is to be signed by the notary. 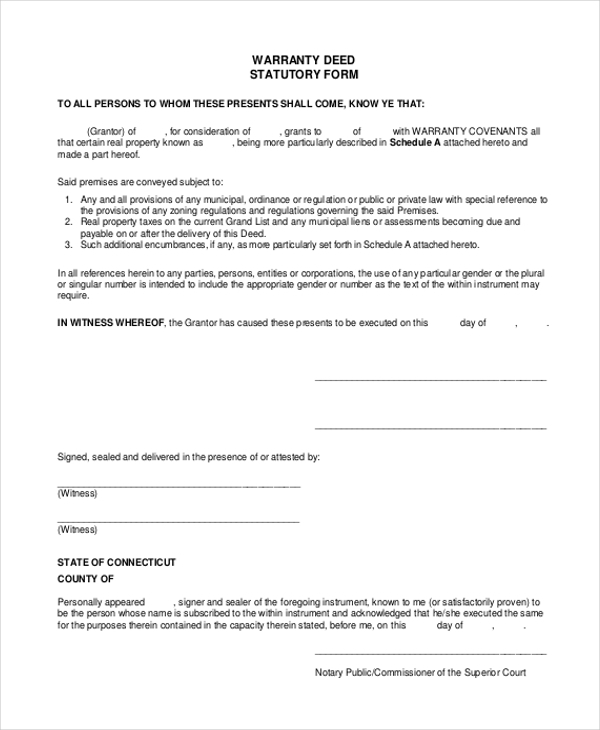 This warranty deed in trust form offers you legible space to describe about the main aspects of the property and also details about the power and authority of the trustee. This warranty deed begins with the declaration about the agreement between the grantor and the grantee and it is followed by details of the taxpayer- it concludes with an acknowledgement from notary. 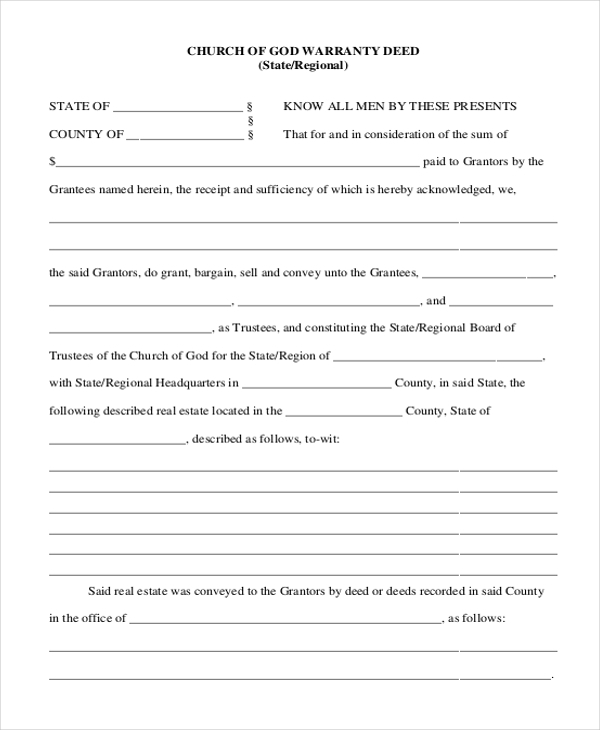 This warranty deed would be useful for church warranty deeds and it comes with a broad space to describe about the real property being transferred to the grantee. It also defines the duties of the trustees. 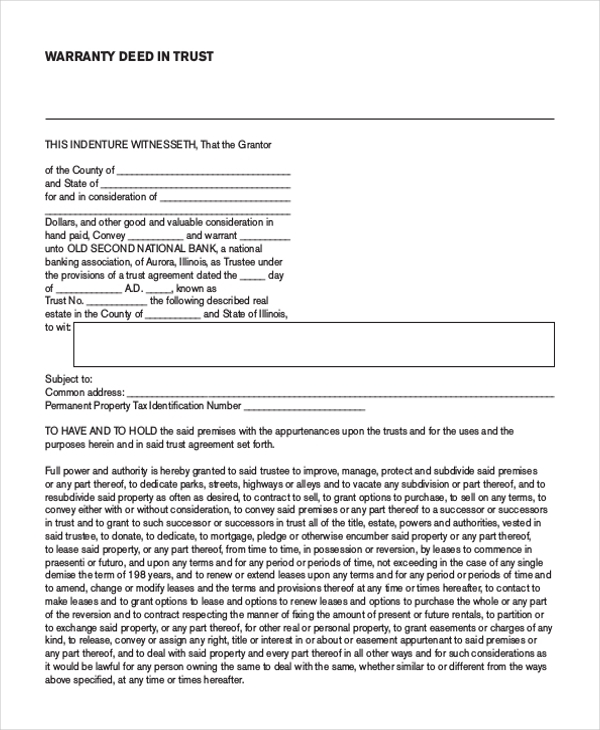 This real estate warranty deed begins with the declaration of the duties of the trustee regarding the real estate property followed by description of the property and other standard sections of such a deed. 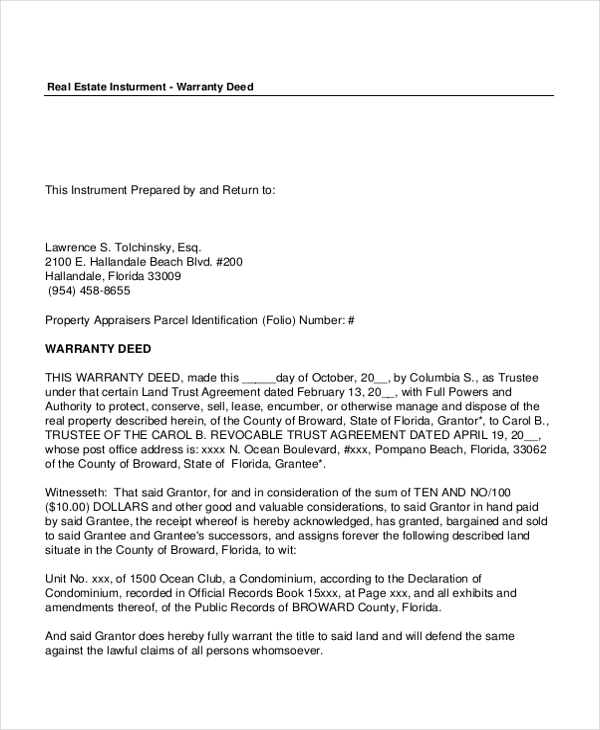 What is The Purpose of Warranty Deed? Everybody demands a guarantee when he or she receives something and the fact is truer when it comes something as huge as property affairs. This is where the warranty deed comes in. 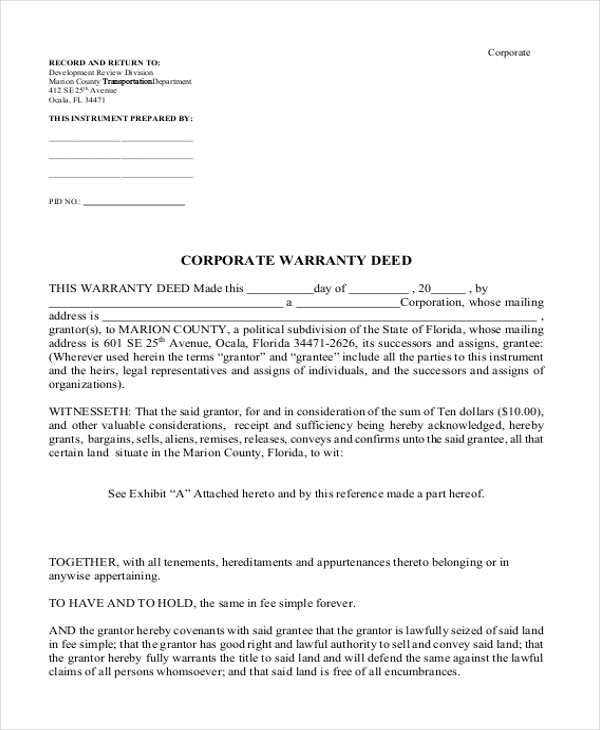 The main purpose of the warranty deed is to assure the grantee on part of the grantor that the latter hold legal title to the property in question and also has the authority to convey it to the grantee or the buyer. This way, the grantee can be content that he is going for a completely legitimate transaction as in the case of any trouble he now has the power to question the grantor. You can also see Quick Claim Deed Forms. 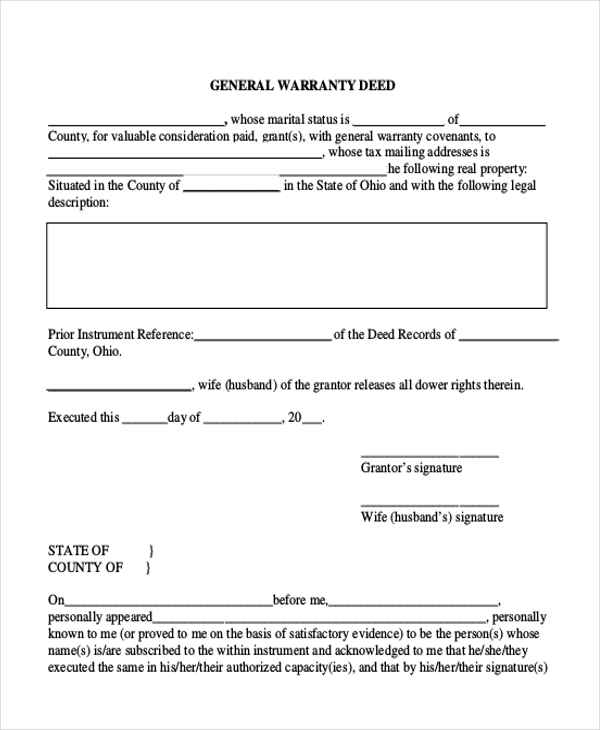 A warranty deed is much needed when a person is about to receive a real property from the property holder. Both the grantor and the grantee would benefit from such a deed form as it helps to make the whole affair of property transfer legal. As such deeds are framed and acknowledged by notaries, the legal firms, lawyers, courts and notaries require the warranty deed. Besides, churches too would need warranty deeds when a property transfer is about to take place concerning the church. If the coverage term is shorter, one has to go for a special warranty deed form. 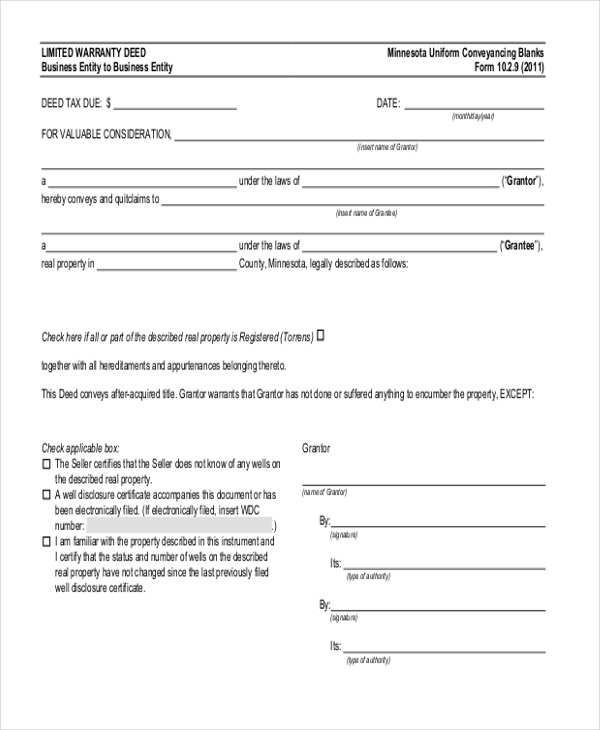 If you are looking for ideas on how to frame warranty deed forms, the sample deed forms mentioned above would be a great help for you. Whether you want general warranty deeds or special warranty deeds, the samples here would be able to assist you every way. All the forms here are easily modifiable.